The Democrats stacked the deck against Donald Trump at the FBI, and they wanted to do the same to Brett Kavanaugh. That’s because DC is one incestuous cesspool. And the city has been repugnant for so long, the bureaucrats no longer smell the stench. Look at the connection between all the Leftists determined to rid America of its best citizens…Conservatives. BOMBSHELL: Christine Blasey Ford’s brother worked with Peter Strzok’s sister-in-law at Exelis Inc, a US Defense and Intelligence contractor. Think any of this is a coincidence? And what of the connection between Ford’s lawyer and the #NeverTrump movement. Remember when Ford revealed how she obtained representation? MILLER: Just a couple of clean-up questions, first of all. Which of your two lawyers did Senator Feinstein’s office recommend? This is worse than collusion, as it is an all out assault on an innocent man by Democrats. A planned attack. And it all began with the “leak”. President Trump pulled no punches when he mocked Feinstein’s answer about leaking the information that Ford had asked be kept confidential. This is how the game gets played in DC. Essentially, we have a partisan woman who wanted to see Kavanaugh taken down at any cost. The idea had been proposed via social media, and Democrats know that proving a negative is next to impossible, particularly when the lie is 36 years old. Once the plot was in motion, Ford sent the letter to Feinstein’s office. Feinstein sat on the information, while coaching the liar, then eventually getting Ford legal representation. The firm selected has as one of its principals a vapid Leftist who hates President Trump, Conservatives, and yes Americans. If we connected all the dots on this genealogy chart, we would find everybody in this tree to be kinfolks. The fact is when it comes to the family tree of Leftists, Democrats are more inbred than any Hillbillies. And as for those willing to do Conservatives harm, Democrats are only two degrees of separation from each other at best. Moreover, it’s the inbreeding that has cause them to have dementia and host of other mental illnesses from which most of them suffer. You only need look at the Mueller farce for another indication of inbred derangement at play. The connections to each other, Hillary Clinton, the Obama administration, the FBI, the media startles even the most naive among us. They either went to school together, worked together in previous jobs, are married to one another, or are screwing each other on the side, and I don’t mean screwing in the “what they’re doing to Kavanaugh” sort of way. 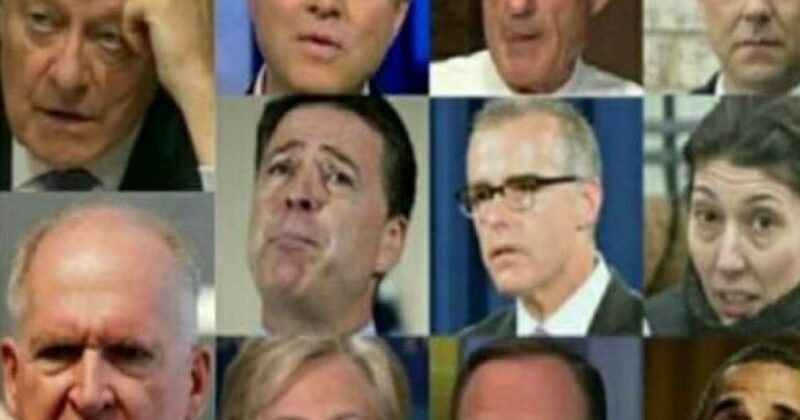 While Mueller and team continue looking for Russian connections to Trump, they ignore the in-your-face evidence against Obama, Clinton, the Podestas, the FBI, even Mueller himself. Further, they continue to use the media as their setup team. Democrats are crooked to their rotten cores and just as stupid. The problem is DC is so chocked full of them, they don’t even see their delusions. That’s what happens when you are locked in a cocoon of ignorance for too long. Democrats live on the muscle-memory of James Comey’s crooked FBI. But they will find things are different now. There will be more connections uncovered in this mess. And like with the Mueller “investigation”, this farce too has the stench of the cover-up. I can’t wait to get to the bottom of this, because I know Kavanaugh, Conservatives, and yes I too will be vindicated. Not that it’s necessary.